- Committed to the needs of local shoppers, vendors and farmers. Escondido, Rancho Bernardo and Poway. Stroll through sections featuring Local Artisans, Fresh Food and Neighborhood Merchants. Support your local community and contribute to the local economy. Visit with and buy from merchants, vendors and farmers committed to doing business the "old fashioned" way; person-to-person and face-to-face. Closed every year only on Easter Sunday. but only when they fall on a Sunday market day. The Farmers Market and related events are held at the Sikes Adobe Historic Farmstead on the Farmstead Grounds. Some dusty conditions, ground mulch and/or leaves and twigs on the ground is to be expected. Most surfaces, including the parking area and the cleared field where the Farmers Market is set up, will have areas with dips and bulges. This is a Rural/Rustic Farmstead Setting. For safety reasons and to preserve the adjacent ecology, do not wander into un-mowed and/or un-cleared sections surrounding the market area. Un-mowed and un-cleared grasses and brush may occasionally contain snakes (including rattle-snakes), poison oak and other plants, fleas and ticks, as well as various sensitive, threatened, and endangered species of plants and animals. Please remain within the cleared and defined Farmers Market and Farmstead areas. This is a Historic Landmark. All geological and archeological resources are protected. It is important that the geological features of the area remain undisturbed to ensure a healthy ecosystem. Archeological resources are protected. Removal of any artifacts erases cultural history information of the San Dieguito River Park. Artifacts must be studied in their original location or the information is lost. Relics that remain may have religious value, and the removal of these artifacts can be considered the equivalent of stealing from a church. No collecting or removing of any plant or animal; they are protected. It is important not to disturb the ecosystem. Because of the large amount of people who visit the grounds, picking flowers or breaking off a branch can have long-term negative impacts on the ecosystem. For every snake, lizard or insect that is killed or removed, many rodents or other insects will not be eaten and instead allowed to thrive and multiply unchecked. Please Note: Location information and directions to our address IS NOT CORRECT IN APPLE MAPS (iPhone, iPad, etc) as of IOS version 8.1.1. We have notified Apple of the inaccuracy in their maps, and we are patiently awaiting corrections. Please DO NOT rely on location or directions to this address using Apple Maps until we receive further notice. - If you want to input the exact GPS coordinates to correctly navigate to the farmers market location/address, please enter 33.067359,-117.067207 into your map's search or address field. Important: If you plan to use GPS to navigate to the farmers market, please input the complete address 12655 Sunset Drive into your device. If you only input "Sunset Drive, Escondido" planning to locate us once you are "somewhere" on our street, you may instead find yourself on a section of Sunset Drive that is north of our location, and that DOES NOT connect to the section of Sunset Drive where we are located. - If you want to input the exact GPS coordinates to correctly navigate to the farmers market location/address, please enter 33.067359,-117.067207 into your GPS search or address field. Take I-15 north, to Via Rancho Parkway, toward Felicita Park/San Diego Wild Animal Park. Turn RIGHT onto E. Via Rancho Parkway. Pass the Shell Station and the Chevron Station on the right; turn right at the 1st traffic light onto Sunset Drive. Follow the roadway as it curves to the right; continue past the Golf Driving Range. Continue ahead across the wooden bridge; you will then see the back of the Chevron Station on the right. Continue on Sunset Drive past the Trailhead Staging area on the left to the Farmstead grounds (on the left, across the street from the Self Storage facility). Park on the street, or in the Trailhead Staging area/parking lot. For visitors with mobility concerns, proceed down the Sikes Adobe dirt-driveway to a designated area that may provide more level access to the market. Take I-15 south, to Via Rancho Parkway. Head southwest on Bear Valley Parkway S, toward Via Rancho Parkway. Pass Kit Carson Park on the right; then continue straight through the intersection with Beethoven Drive. Take Del Dios Hwy to Via Rancho Parkway. Proceed Eastbound on Via Rancho Parkway for about 3.25 miles. 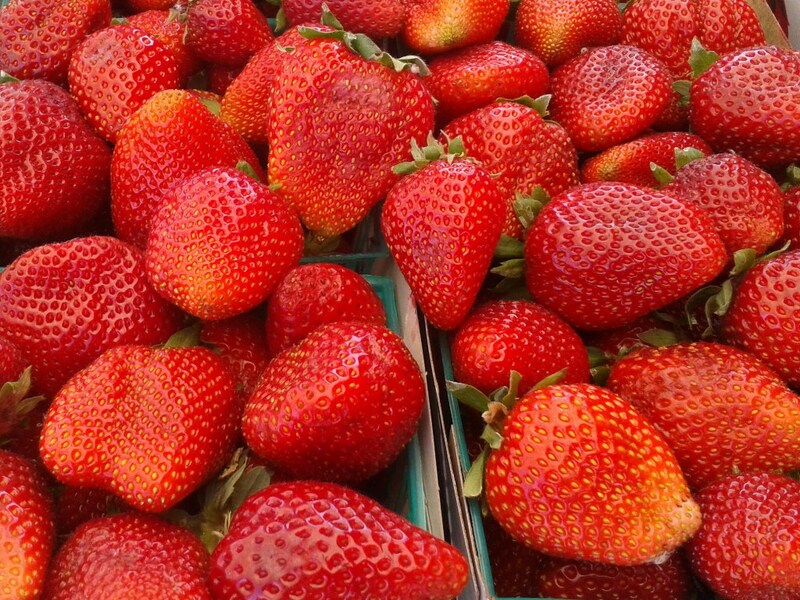 The North San Diego Certified Farmers Market is a "Rain-or-Shine" market. Only in extreme situations where the health/safety of the vendors/customers may be at risk will the market be canceled or close early due to conditions. The market will not operate when there is a declared State of Emergency for the local area &/or there is a possible/likely threat to the health/safety of vendors/shoppers at the market location. Any decision to cancel the Sunday market "in advance" will be based on there being a declared State of Emergency in effect &/or a possible/likely threat to the market location existing at or after 5pm on the Friday before. A decision to cancel the upcoming Sunday's Farmers Market that is announced as early as Friday evening will be final, even if conditions improve over the following 36-42 hours leading to the scheduled market start time on Sunday. 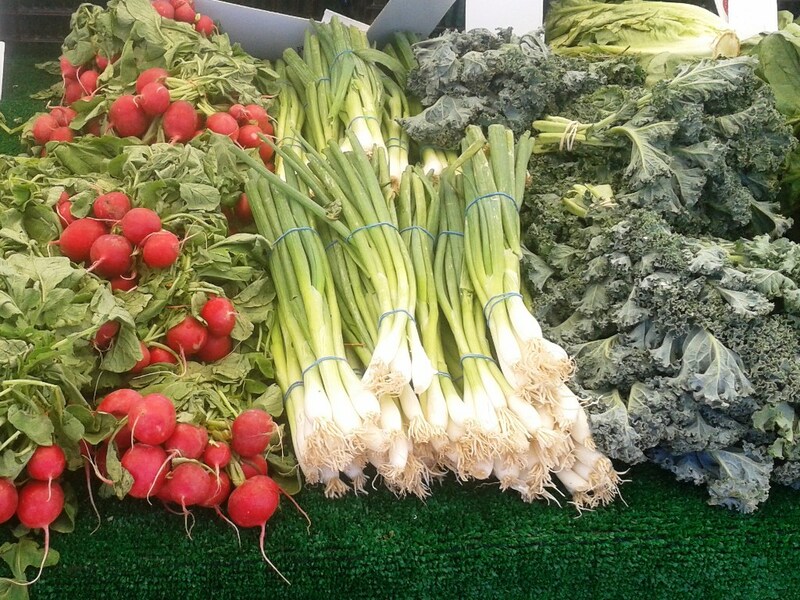 SUNDAYS (10:30am-3:30pm): Local, Farm Fresh Produce. Local Flowers and Plants. Arts and Crafts from area artisans. A local weekly event, managed by residents of the local area, featuring local farmers, growers, residents and businesses, all to make shopping at the Market a truly local, quality, and shared experience. It's all about community. And at the heart of it all, a traditional Farmers Market with farm-to-table produce and Local Artisans. Easy to get to. I-15 at Via Rancho Parkway, just 3/4 mile east off the I-15 freeway! Amex, MasterCard, Visa, Discover and checks accepted* at the Farmers Market to purchase Market Money. Market Money is accepted by ALL North San Diego Certified Farmers Market vendors just like cash. Market Money never expires, and can be used at the North San Diego Certified Farmers Market any time. NSDCFM Market Money makes a GREAT GIFT too! 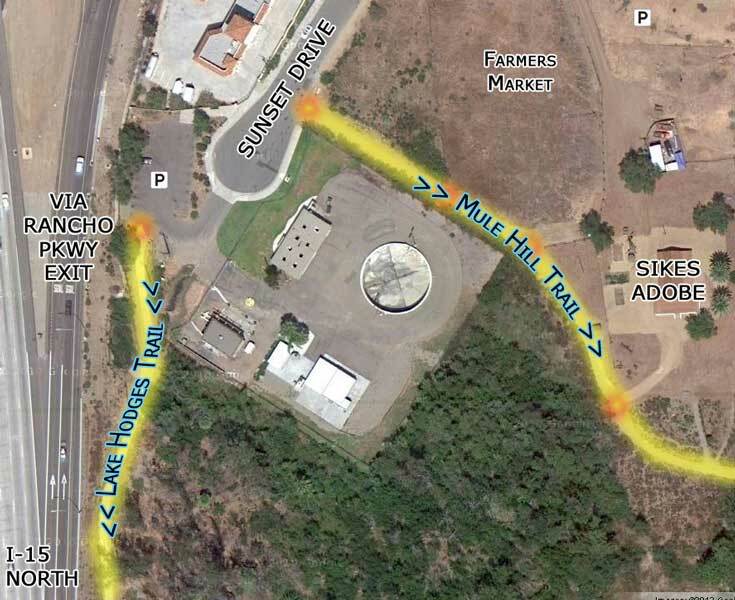 The San Dieguito River Park goal is to create a multi-use trail system for hikers, bicyclists and horseback riders that will extend from the ocean at Del Mar to the San Dieguito River's source on Volcan Mountain, just north of Julian. This is a distance of approximately 55 miles. This linear trail system has been named the "Coast to Crest Trail". The historic Sikes Adobe site is part of the San Dieguito River Park preserve. 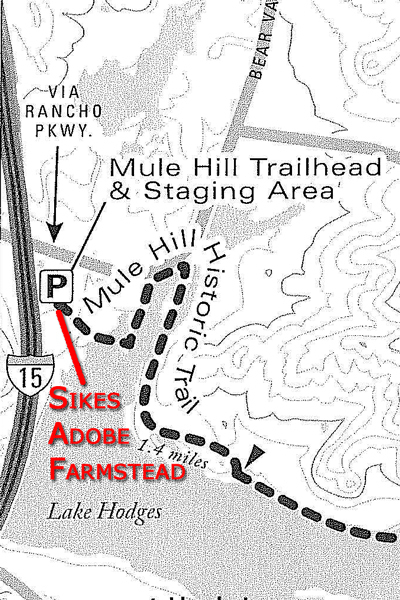 The Sikes Adobe Historic Farmstead is the entrance point for the Sunset Drive Trailhead of the Mule Hill Historical / San Pasqual Valley Agricultural Trail. It also provides access to the entrance point for the North Shore Lake Hodges Trail. Difficulty: Easy/Medium Full Length: approximately 16.5 miles round trip (excluding the Bernardo Summit Trail). Features: Views of Lake; birds. Dogs Allowed: Yes, on leash only. 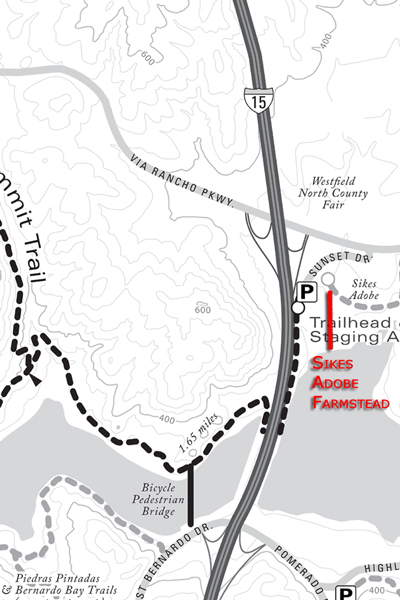 The North Shore Lake Hodges Trail segment up to the Bernardo Summit Trail is 1.65 miles long starting at the Sunset Drive Trailhead (aprox 3.25 miles round-trip). 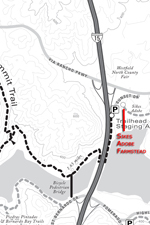 The entire North Shore Lake Hodges Trail length (excluding the Bernardo Summit Trail) is 8.2 miles, with 1.65, 2.35, 1.1, 1.2 and 1.9 mile segments. The entire trail round-trip starting from and returning to the Sunset Drive Trailhead is approximately 16.5 miles. The Bernardo Summit Trail Segment is classified as "strenuous", and is 1.95 miles one-way (almost 4 miles round-trip). The trail length from the Sunset Drive Trailhead, up the Bernardo Summit Trail and returning to the Sunset Drive Trailhead is approximately 7.25 miles round-trip. Use: Hiking, Mountain Biking, or Horseback riding only. Difficulty: Easy/Medium Length: approximately 10 miles one-way. 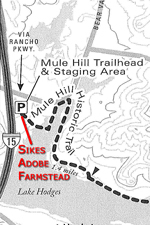 The Mule Hill Historical Trail segment is 1.4 miles long starting at the Sikes Adobe (2.8 miles round-trip). The entire Mule Hill Historical / San Pasqual Valley Agricultural Trail length is 10.25 miles, with 1.4, 6.1, and 2.75 mile segments. The entire trail round-trip starting from and returning to the Sikes Adobe is 20.5 miles. Read about the history of our Farmers Market, and the entire area the North San Diego Certified Farmers Market calls home. The communities we support and serve all have strong ties to farming and agriculture, making the location of our Farmers Market unique among San Diego farmers markets. 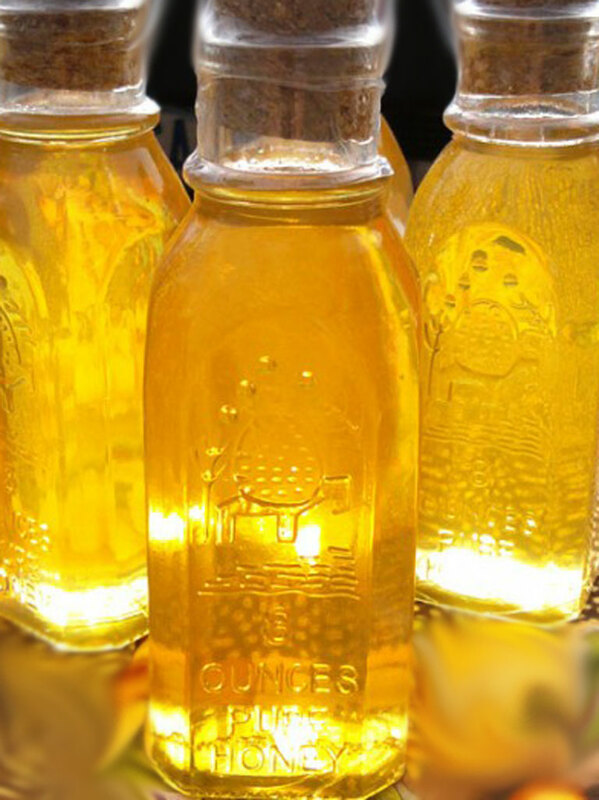 The North San Diego Certified Farmers Market is a Farmers Market on the grounds of an 1870's Farmstead, located in a community where farming and agriculture played a significant role both at the time California was settled and attained statehood, and after. ... originally the Webb Park Certified Farmers Market in Rancho Bernardo (5/2010-3/2011), the Farmers Market initially ran on Tuesday evenings between May 2010 and October 2010, and then expanded to operate Tuesday afternoon & evening from October 2010 until December 2010. From January 2011 through March 2011, the Webb Park Certified Farmers Market grew to occupy most of Webb Park in Rancho Bernardo, and operated as an "all-day" Sunday Market. The Webb Park Certified Farmers Market combined efforts with the Sikes Adobe Historic Farmstead Certified Farmers Market (which had opened in Nov. 2010) in the San Pasqual Valley area of North San Diego, was renamed the North San Diego (Sikes Adobe) Certified Farmers Market, and reopened in its current location, south of Escondido on Sunday, April 10, 2011, at the Sikes Adobe Historic Farmstead. A Wednesday lunch-time "FARM-STAND at the FARMSTEAD" Market ran briefly from Wednesday, November 30, 2011 through Wednesday, June 27, 2012. The Sikes Adobe Historic Farmstead began operating the Sikes Adobe FARMSTAND during the Sunday Farmers Market in September 2012, and currently offers produce grown on site for sale to the public weekly during the Farmers Market. The Sikes Adobe Farmhouse is a State Point of Historic Interest and a City of San Diego historic site that is being restored by the San Dieguito River Park Joint Powers Authority to its period of significance - the period from 1869 to 1899 - which is the time period when it was occupied by the Sikes family. From it we can learn what life was like for the pioneer settlers in San Diego shortly after statehood. The Farmhouse was initially restored in January 2004. In October 2007 it burned to the ground in the Witch Creek Fire, except for the adobe walls. Rebuilding began in August 2009. The Grand Re-Opening Ceremony was held June 26, 2010. In September 2012, after over 100-years, the Sikes Adobe Historic Farmstead resumed small-scale farming on the site, and currently operates the Sikes Adobe FARMSTAND on Sundays during the Farmers Market. 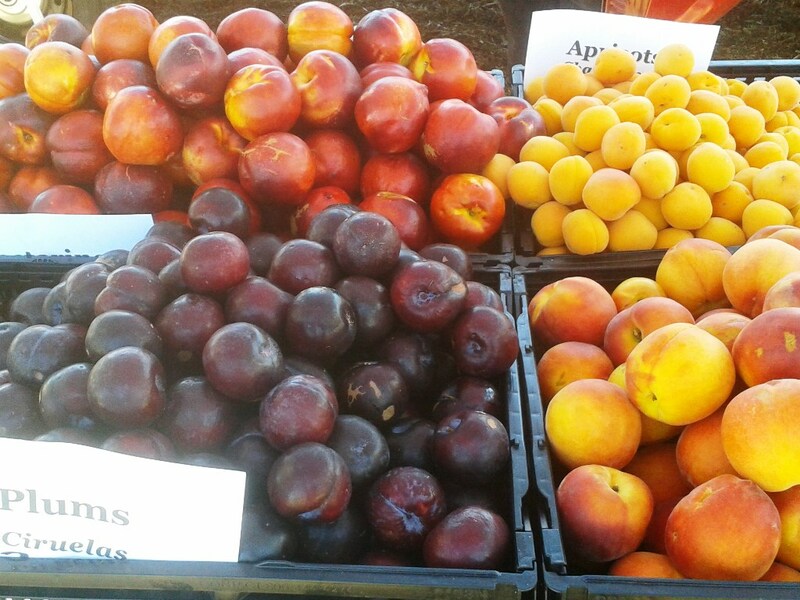 The Sikes Adobe FARMSTAND offers the produce grown on site for sale to the community, and 100% of the proceeds from the Sikes Adobe FARMSTAND sales are used to support the ongoing preservation & restoration of the Sikes Adobe Historic Farmstead. Established in 1989, the San Dieguito River Park is a 94,000-acre open space greenway of regional significance in San Diego's North County, stretching more than 55 miles from the ocean at Del Mar to Volcan Mountain near Julian, and home to a diverse array of sensitive animal and plant species, many of special status. The River Park aims to protect the natural and cultural resources, sensitive lands and waterways in the San Dieguito River Valley and provide compatible recreational opportunities for hikers, bikers and equestrians. The location of Escondido was first identified and discovered by Juan Bautista de Anza, a Spanish explorer, in 1776. Later, the area became part of the Rancho Rincon del Diablo (the devil's corner) land grant bestowed to Juan Bautista Alvarado in 1843 by the Mexican Governor. 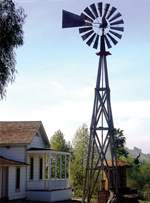 In 1886, the Escondido Land and Town Company acquired the land grant, laid out the town site, and divided the valley into small farms suitable for grapes or citrus. Philip Crosthwaite is believed to have been the first white settler in the Poway area. He built an adobe house and took up ranching in 1859. The 1880's saw a prosperous and well-populated valley. Families were settling on farms, planting orchards and vineyards, and raising grain. Dairying was profitable, as was beekeeping. By 1887, there were about 800 people in the Poway area. By the early 1900's, settlers had established themselves and had found a good and satisfying life. Poway became known for its exceptionally fine peaches and for its vineyards. Grain and alfalfa were other major products. The first recorded landowner in the community now known as Rancho Bernardo was the English sea captain, Joseph Sevenoaks, who sailed in and out of San Diego harbor transporting animal hides as early as 1824. He became a naturalized Californian in 1833 and changed his name to Don Jose Francisco Snook. After 20 years at sea, Snook retired to San Diego. The Mexican Governor granted Snook 8,800 acres of land in 1842. The lands granted to Snook were in the Valley called Canada de San Bernardo. San Bernardo's only recognized value at the time was for grazing sheep, horses and mules. Snook courted the daughter of his neighbor, Don Juan Bautista Alvarado, who was the owner of Rancho Rincon Del Diablo (now Escondido - see above). After a second land grant by the Mexican Governor in 1845, they married. They built a home and settled on Rancho San Bernardo. Their land grants encompassed 17,763 acres, from the San Dieguito River Valley in the North to Los Penasquitos Creek in the South, including what is now the town of Rancho Bernardo. The San Pasqual Valley is the northernmost community of the city of San Diego. It is bordered on the north by the city of Escondido, on the east and west by unincorporated land within San Diego County, and on the south by the city of Poway and the community of Rancho Bernardo. Much of the valley is part of the San Pasqual Valley Agricultural Preserve. Agricultural land uses dominate the valley's landscape and include various orchard, vine, field crops, dairy operations, and pasture land. What is a Certified Farmers' Market? A certified farmers' market (CFM) is a location approved by the County Agricultural Commissioner where certified farmers offer for sale only those agricultural products they grow themselves, or products from another certified farmer. What is a Certified Farmer? Inspectors from the Department of Agriculture, Weights and Measures inspect farms and other properties to verify what is raised or grown there. After satisfactorily meeting the requirements of the inspection, the farmer is certified for specific products. This certification allows the farmer to sell his produce at Certified Farmers' Markets. 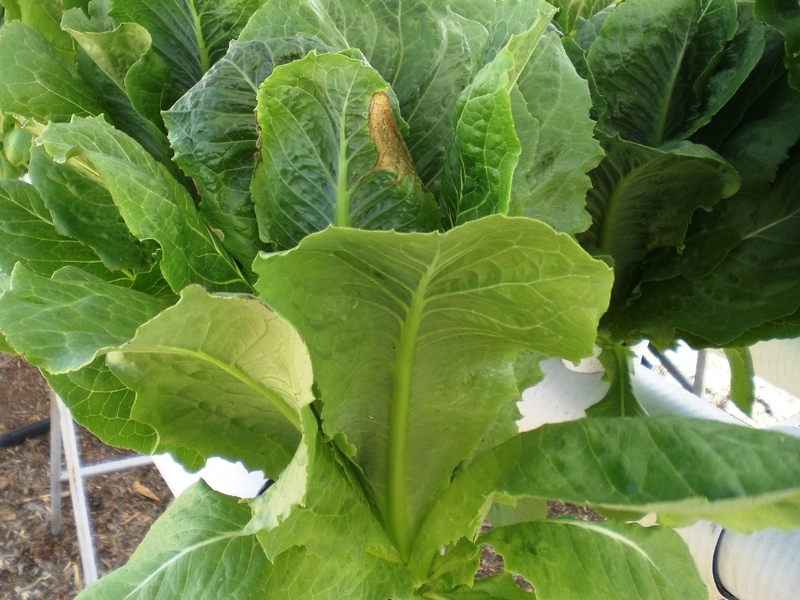 NSDCFM is approved by the County of San Diego Department of Agriculture, Weights and Measures, and permitted by the San Diego County Department of Environmental Health Food & Housing Division. Our organizer permits and certifications are posted at each market, and are available for public viewing. Ask any of our farmers or food vendors at the market to see their Agriculture Certificate or Health Permit; they are posted in each vendor stall for public viewing. For farmers, it shows where their farm is and what they grow there; for food vendors, it shows that they have met all San Diego County Department of Environmental Health requirements, and the location of their certified kitchen and/or commissary. 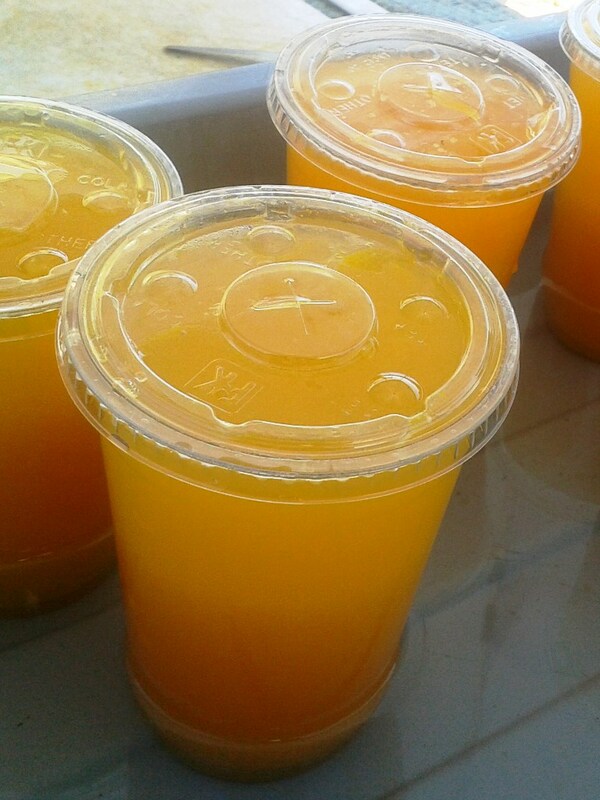 Most food vendors do not offer "home-prepared" foods at the Certified Farmers Market. "Cottage Food Operations" are permitted to utilize a home kitchen, and their Health Permit will show the location of their home kitchen, and that they qualify to operate under the Cottage Food Laws. Cottage Food Operators will be clearly identified on their Health Permit, on the product labels, and on their market signage. Agriculture Inspectors inspect our Certified Farmers Market multiple times a year, unannounced; they also inspect each farm. San Diego County Health Inspectors routinely inspect our Certified Farmers Market and all of our food vendors at least annually, also unannounced. 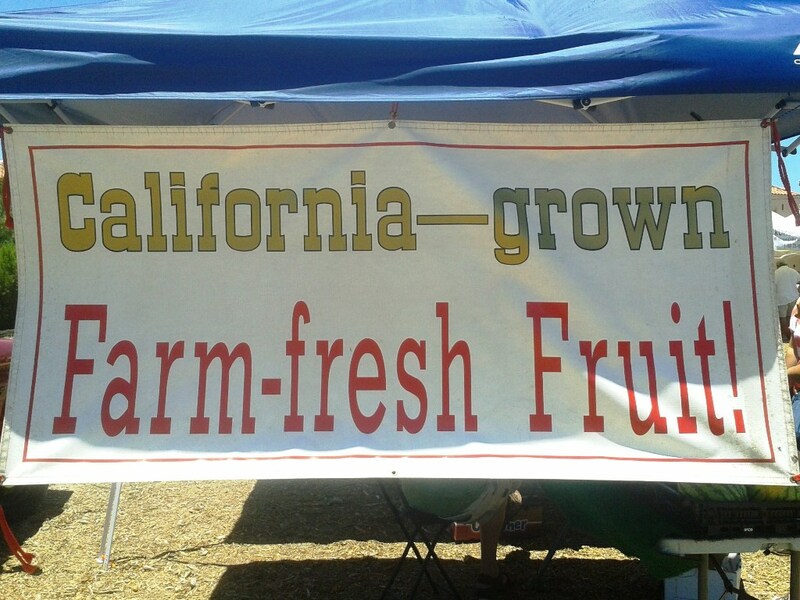 San Diego County is blessed with a long growing season and fresh produce is available year round. With over 6,000 farms in the county, San Diego offers a wide variety of fresh produce at any time of the year. You may be wondering what's in season, the Harvest Calendar below can help you find out what Farm fresh produce may be available at the North San Diego Certified Farmers Market. Serving all of North San Diego & the San Pasqual Valley, including the communities of Escondido, Rancho Bernardo & Poway. Content copyright 2011-. North San Diego (Sikes Adobe) Certified Farmers Market. All rights reserved.